Is your old car just “not doing it for you” anymore? Visit the Non-Commissioned matchmakers at Super Car Guys today, and with lender approval, you can drive away in any car on our lot for just $8 down! 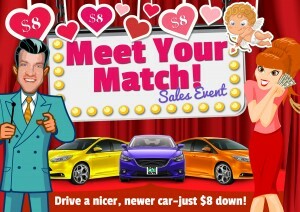 0 comment(s) so far on Meet Your Match Event at Super Car Guys!